iTether is a new app that allows you to tether your iPhone’s internet to your Mac or PC. For $14.99, iTether enables users to utilize their iPhone’s data plan to access the internet on their laptop or desktop computer via a USB connection. iTether is the first app of its kind to make it on to the app store, and it may not last long – Apple has traditionally prohibited apps that allow tethering, as their U.S. carrier partners such as AT&T charge an additional fee for the service. 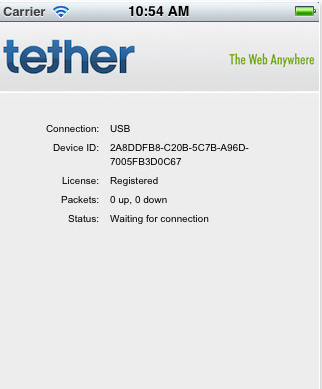 In addition to the app, iTether requires a software download for PC or Mac – available for free from Tether.com.